Renowned for delivering exceptional cosmetic results, the team at LT Dental in Perth will examine your individual wants, and work to create you a beautiful smile that will leave you beaming! Treatment options to provide this stunning result include treatment options such as tooth whitening, porcelain veneers, all-ceramic dental crowns and bridges, and the replacement of missing teeth with implant teeth solutions. Would you like a whiter, brighter smile? If your teeth are stained or discoloured, tooth whitening can bring your smile to life; and it’s now fast, simple and effective. In just 90 minutes at LT Dental, you can achieve a dramatic and long-term improvement. If you have less time available, we can also help you with custom-made application trays and kits so you can whiten your teeth at home. We carefully apply thin shells of porcelain to the front of your teeth, for a long-lasting naturally whiter solution. 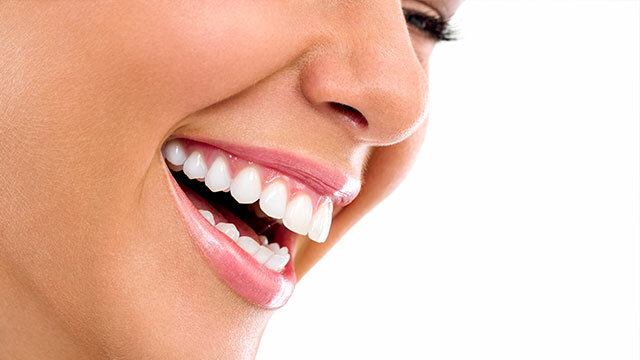 Find out more about veneers here. Be careful of cheap and ineffective whitening products available in chemists and supermarkets. Talk to us first before you spend any money on a treatment that may not work, and that could potentially cause problems in the future. Broken, chipped or damaged teeth can have a devastating effect on your smile and make you feel self-conscious. However, we can easily correct this situation using crowns or veneers. Porcelain veneers can be used to cover dark or yellow stained teeth, fill unsightly gaps, make shorter teeth longer, or straighten a crooked smile. So you can laugh and smile with confidence! When applied professionally and cared for regularly, veneers can last for well over 10 years and will not decay or stain. If extensive restoration is required due to aggressive wear, decay or fracture, a porcelain crown may be the best solution. These restorations completely encase the tooth, and bind it together. An all-ceramic crown is a highly aesthetic restoration and ensures the long-term health of a badly broken down tooth, in any area of your mouth, especially where the restoration needed is extensive, or in a high pressure area. They can also re-shape and align misplaced, discoloured teeth. Crowded teeth can affect your speech, lip support, facial appearance and most importantly your smile! Crowded or misplaced teeth can also impact on your dental health by making oral hygiene more difficult. Plaque that builds up in these areas can cause gum disease and decay. Correcting the alignment of your teeth can alleviate all these symptoms, and also give you a naturally beautiful smile. For mild to moderately misaligned teeth, the use of porcelain veneers and all-ceramic crowns can be used to reshape and re-align your teeth effectively, producing an ideal cosmetic result. Such as ‘invisible braces’ to re-align your teeth. At the LT Dental Perth, we are excited by the results we achieve for our patients and know you will be too! Please do not hesitate to ask any questions you may have about our cosmetic dental treatments. Simply fill out our contact form and we’ll contact you quickly to book your free consultation. Or, if you’d prefer to talk, please call us on (08) 9328 5027.